Department of Ophthalmology (R. Campbell, E. Campbell, Nesdole, Warder, ten Hove), Division of Geriatric Medicine (Gill) and Department of Public Health Sciences (Whitehead), Queen’s University, Kingston, Ont. ; Department of Ophthalmology (R. Campbell, E. Campbell, Nesdole, Warder, ten Hove), Hotel Dieu Hospital, Kingston, Ont. ; Institute for Clinical Evaluative Sciences (R. Campbell, Gill, Whitehead), Kingston, Ont. ; Department of Ophthalmology (El-Defrawy), Department of Medicine (Bell) and Institute of Health Policy, Management and Evaluation (Bell), University of Toronto, Toronto, Ont. ; Department of Ophthalmology (El-Defrawy), Kensington Eye Institute, Toronto, Ont. ; Institute for Clinical Evaluative Sciences (Bell), Toronto, Ont. ; Division of Geriatric Medicine (Gill), St. Mary’s of the Lake Hospital, Kingston, Ont. ; Department of Ophthalmology (Hooper), University of Western Ontario, London, Ont. ; Department of Ophthalmology (Hooper), St. Joseph’s Hospital, London, Ont. ; Department of Ophthalmology (E. Campbell, Nesdole, Warder, ten Hove) Kingston General Hospital, Kingston, Ont. BACKGROUND: Across Canada, graduates from several medical and surgical specialties have recently had difficulty securing practice opportunities, especially in specialties dependent on limited resources such as ophthalmology. We aimed to investigate whether resource constraints in the health care system have a greater impact on the volume of cataract surgery performed by recent graduates than on established physicians. METHODS: We used population-based administrative data from Ontario for the period Jan. 1, 1994, to June 30, 2013, to compare health services provided by recent graduates and established ophthalmologists. The primary outcome was volume of cataract surgery, a resource-intensive service for which volume is controlled by the province. RESULTS: When cataract surgery volume in Ontario entered a period of government-mandated zero growth in 2007, the mean number of cataract operations performed by recent graduates dropped significantly (−46.37 operations/quarter, 95% confidence interval [CI] −62.73 to −30.00 operations/quarter), whereas the mean rate for established ophthalmologists remained stable (+5.89 operations/quarter, 95% CI 95% CI −1.47 to +13.24 operations/quarter). Decreases in service provision among recent graduates did not occur for services without volume control. The proportion of recent graduates providing exclusively cataract surgery increased over the study period, and recent graduates in this group were 5.24 times (95% CI 2.15 to 12.76 times) more likely to fall within the lowest quartile for cataract surgical volume during the period of zero growth in provincial cataract volume (2007–2013) than in the preceding period (1996–2006). INTERPRETATION: Recent ophthalmology graduates performed many fewer cataract surgery procedures after volume controls were implemented in Ontario. Integrated initiatives involving multiple stakeholders are needed to address the issues facing recently graduated physicians in Canada. In many nations, including Canada, cataract surgery, a highly technology-dependent procedure, is the most common operation performed.19–22 Consequently, practice opportunities are sensitive to overall constraints on health system resources and serve as an exemplar of issues facing many resource-intensive specialties. Furthermore, Ontario has undertaken a process of health system funding reform, which incorporates direct government-controlled, patient-based funding to institutions for cataract surgical cases. The number of cataract operations is provincially controlled, which has resulted in volume caps at each institution. This provides a unique opportunity to identify and study the impact of resource constraint on the practice of recent graduates in a fashion not possible for areas of care where global budgeting precludes precise identification of resource constraints. To investigate whether resource constraints in the health care system have a greater impact on recent graduates than on established physicians, we conducted a retrospective cohort study comparing the effect of access to health system resources on the practice profiles of recent ophthalmology graduates and established physicians. To investigate how access to clinical resources has altered the practice of recent ophthalmology graduates, we conducted a population-based, retrospective cohort study comparing the practice profiles of recent graduates with those of established ophthalmologists between Jan. 1, 1994, and June 30, 2013. We examined both resource-intensive, volume-controlled procedures and minimally resource-intensive, non–volume-controlled health services. Confidentiality was maintained via encrypted identification numbers and strict adherence to privacy protocols. We defined recent graduates as physicians in their first 2 years of independent practice, to allow for lags in the initiation of practice. Independent practice was defined as commencing on the date of the first independently performed clinical service (consultation, other office visit or procedural service). To allow for the possibility of postresidency fellowship training, we specified that independent practice had to have commenced within 3 years of residency completion for the physician to be classified as a recent graduate. The comparison group of established physicians comprised all other ophthalmologists in Ontario who were in practice within each quarter, as defined by the provision of consultation, other office visit or procedural services. The cessation of clinical billing was used to assess physicians’ retirement or departure from the province. To investigate the potential effect of subspecialization among recent graduates in areas of ophthalmology focused on operations other than cataract surgery, we divided ophthalmologists into mutually exclusive categories based upon the number of subspecialized operations performed each year. The subspecialties were corneal surgery, glaucoma surgery, retina surgery, strabismus surgery and orbital surgery. Surgeons were classified as providing subspecialized surgery if they performed 10 or more operations in the year within one subspecialty. Surgeons meeting the criteria for more than one subspecialty were assigned to the one in which they performed the greatest number of operations. Exclusive cataract surgeons were defined as those who performed cataract surgery and none of the subspecialized ophthalmic operations. Using the OHIP database, we examined cataract surgery as a representative operating room–based, resource-intensive, volume-controlled procedure. We identified all cataract surgery cases in each quarter during the study period and linked each operation to the individual attending surgeon using the ICES Physician Database. To evaluate whether observed effects were specific to resource-intensive, volume-controlled procedures, we also evaluated clinic-based aspects of care that are not volume-controlled. Specifically, we evaluated all consultations provided by ophthalmologists, as well as laser iridotomy procedures. Laser iridotomy is performed routinely in ambulatory care office settings to prevent or treat angle-closure glaucoma.27 Finally, operating room days were defined as days on which the surgeon provided any of the ophthalmic operations evaluated in the study (cataract surgery, corneal surgery, glaucoma surgery, retinal surgery, strabismus surgery or orbital surgery). We descriptively compared trends in the mean number of services per quarter for cataract surgery, consultations and laser iridotomy procedures among recent graduates and established ophthalmologists providing these services. We then compared differences between recent graduates and established ophthalmologists in rates of cataract surgery, consultations and laser iridotomy procedures using 2-sample z-tests. To provide additional detail, we used segmented regression to evaluate individual physician cataract surgery rates within each group before and after cataract surgery volume limits led to the levelling-off of total provincial cataract surgery volumes at the end of 2006, controlling for the number of ophthalmologists serving the population.28 Details of the segmented regression analysis are presented in Appendix 1 (available at www.cmaj.ca/lookup/suppl/doi:10.1503/cmaj.150674/-/DC1). We also performed 2 sensitivity analyses for the segmented regression analysis. In the first, data from 2006, the final year of the expansion of resources, were excluded to assess the possibility that an outlier year caused an overestimation of the impact of subsequent resource constraint. In the second sensitivity analysis, to avoid having physicians belong to different groups, surgeons in the recent graduates group were not transitioned to the established surgeons group, but instead were excluded after their period as a recent graduate. We further refined the analysis by using logistic regression models to evaluate the effect of recent graduate status and time period (period with steady growth in total provincial cataract surgery volume [1996–2006] versus period with no growth in total provincial cataract surgery volume [2007–2013]) on cataract surgery volume and operating room days among surgeons who exclusively performed cataract surgery. In these analyses, surgeons classified as recent graduates were not transitioned to the established surgeon group at the end of their period as recent graduates. To confirm that a trend toward subspecialization among recently graduated ophthalmologists did not confound the analysis, we used Cochrane–Armitage tests to examine trends in the proportion of ophthalmologists providing subspecialized surgery. Finally, we investigated regional variation by comparing the number of cataract operations performed by recent graduates and established ophthalmologists across time periods in each of Ontario’s health care administrative regions (Local Health Integration Networks). All analyses were performed with SAS software version 9.4 (SAS Institute). The study protocol was approved by the Queen’s University Health Sciences Research Ethics Board. Between 1994 and 2006, the total number of cataract operations performed in Ontario grew steadily, from about 12 000 to about 36 000 cases/quarter. During this period of steady growth in total provincial cataract surgery volume, the rate ratio for mean number of cataract operations performed by recent graduates relative to established ophthalmologists was 0.79 (95% confidence interval [CI] 0.71 to 0.89) (Figure 1). From 2007 onward, the total number of cataract operations performed in Ontario remained stable, at about 36 000 cases/quarter. During this period of zero growth in total provincial cataract surgery volume, the mean number of operations performed by recent graduates declined sharply, from a high of 147.3 cases/quarter in the preceding period to a low of 36.6 cases/quarter, and the rate ratio for mean number of cataract operations performed by recent graduates relative to established ophthalmologists dropped to 0.44 (95% CI 0.39 to 0.49) (Figure 1). 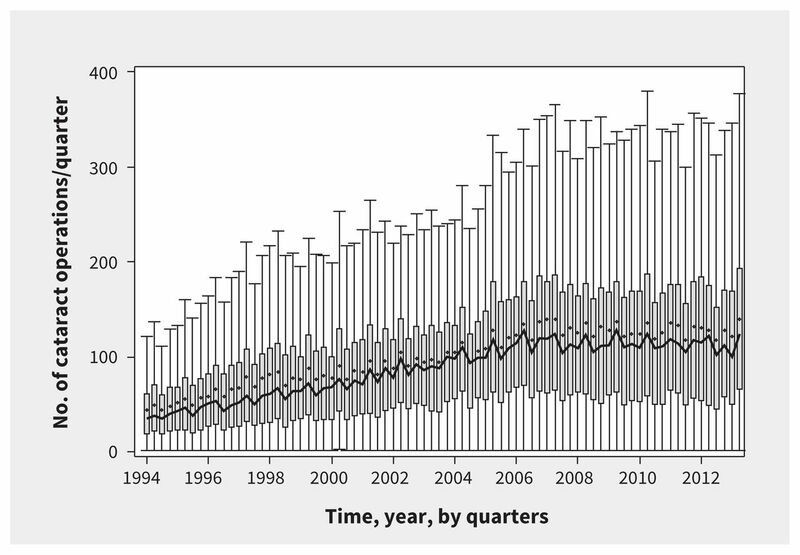 Mean quarterly number of cataract surgery procedures among recent graduates and established physicians, 1994–2013. Among recent graduates commencing practice since 2007, the mean rate of cataract operations subsequently plateaued at a level below that of established ophthalmologists (Appendix 2, available at www.cmaj.ca/lookup/suppl/doi:10.1503/cmaj.150674/-/DC1). The annual number of recent graduates, the number of established surgeons and the number of ophthalmologists ceasing practice remained approximately constant over the study period (Appendix 3, available at www.cmaj.ca/lookup/suppl/doi:10.1503/cmaj.150674/-/DC1). Trends in the total number of cataract operations, consultations and laser iridotomy procedures performed by each group over the study period are shown in Appendix 4 (available at www.cmaj.ca/lookup/suppl/doi:10.1503/cmaj.150674/-/DC1). Higher cataract surgical rates became very rare among recent graduates in the later years of the study, as evidenced by the substantial drop in the 95th percentile for surgeon-specific cataract surgery rate in this group (Figure 2). In contrast, among established physicians, there was a levelling-off of the 95th percentile for surgeon-specific cataract surgery rate, but a decline was not observed (Figure 3). 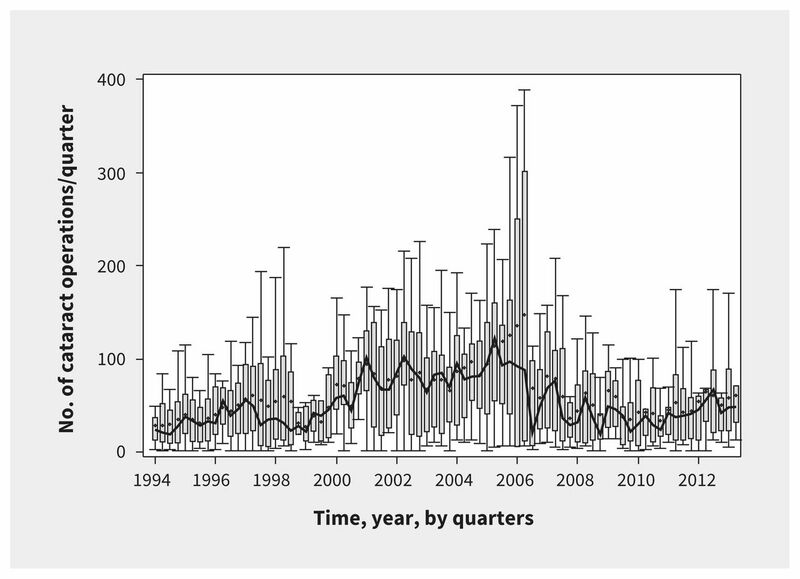 Box and whisker plot showing the distribution of quarterly cataract surgery volumes among recent graduates, 1994–2013. Grey bars represent the 25th through 75th percentiles, and whiskers represent the 5th and 95th percentiles. Small diamonds indicate means, and the thick black line joins medians. Box and whisker plot showing the distribution of quarterly cataract surgery volumes among established physicians, 1994–2013. Grey bars represent the 25th through 75th percentiles, and whiskers represent the 5th and 95th percentiles. Small diamonds indicate means, and the thick black line joins medians. Segmented regression analysis of mean surgeon-specific cataract surgery rates provided detailed, supportive results. Before 2007, the mean rate of cataract operations increased by 1.39 (95% CI 1.04 to 1.74) operations/quarter in the recent graduate group and by 1.50 (95% CI 1.34 to 1.66) operations/quarter in the established ophthalmologist group (Table 1). However, when policy shifts led to a plateau in total provincial cataract surgery volume, beginning in January 2007, the mean number of cataract operations performed by recent graduates decreased by 46.37 (95% CI −62.73 to −30.00) operations/quarter (Table 1). Conversely, among established surgeons, a significant decline in mean procedure rates did not occur (+5.89 [95% CI −1.47 to +13.24] operations/quarter; Table 1). The trend in mean cataract surgical rates slowed from 2007 onward within both groups (−1.62 [95% CI −2.51 to −0.73] operations/quarter for recent graduates; −1.68 [95% CI −2.08 to −1.28] operations/quarter for established ophthalmologists; Table 1). 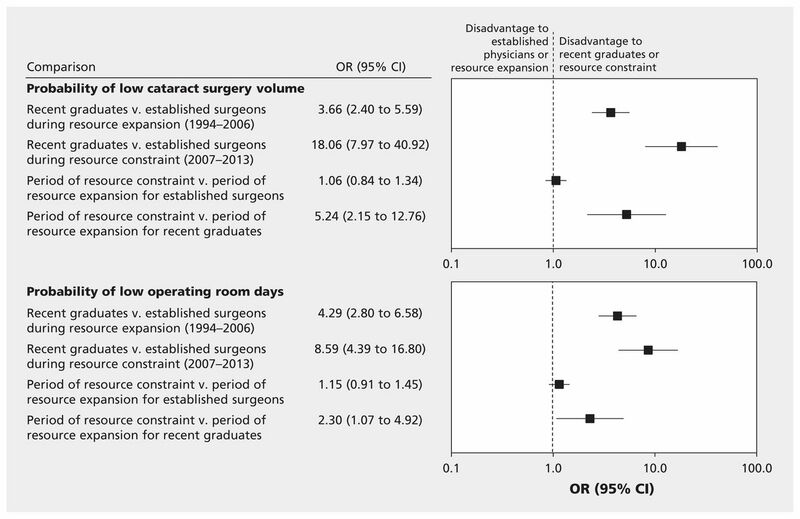 Logistic regression models incorporating surgeons who exclusively performed cataract surgery also showed a significant effect of recent graduate status on both cataract surgery volume and operating room days (Figure 4). In particular, recent graduates were 5.24 (95% CI 2.15 to 12.76) times more likely to fall within the lowest quartile for cataract surgery volume during the period of zero growth in total provincial cataract surgery volume (2007–2013) than in the preceding period, during which total provincial cataract surgery volume grew steadily (1996–2006). Similarly, recent graduates were 2.30 (95% CI 1.07 to 4.92) times more likely to fall within the lowest quartile for operating room days during the period of zero growth in total provincial cataract surgery volume than in the preceding period of steady growth in total provincial cataract surgery volume. In contrast, time period had no effect on volumes for established surgeons (Figure 4). Effect of career stage and time period on probability of low cataract surgery volume and low number of operating room days among cataract surgeons. The figure represents an analysis of 233 established surgeons and 88 recent graduates who were exclusively cataract surgeons. Low cataract surgery volume = lowest quartile for annual number of cataract cases. Low number of operating room days = lowest quartile for annual number of operating room days. The plot uses a logarithmic scale. Note: CI = confidence interval, OR = odds ratio. We conducted multiple sensitivity analyses and additional investigations of comparator procedures (Appendix 5, available at www.cmaj.ca/lookup/suppl/doi:10.1503/cmaj.150674/-/DC1). Exclusion of data from 2006 (the final year before the plateau in total provincial cataract surgical volume) or censoring of data on surgeons after their 2-year recent graduate period yielded results similar to the main analysis. In contrast to cataract operations, surgeon-specific rates of consultations and laser iridotomy procedures did not decrease among recent graduates after 2007. No evidence of a shift toward subspecialization in areas other than cataract surgery was observed among either recent graduates or established surgeons. The finding that declining participation by recent graduates was specific to a resource-intensive procedure, and did not occur in comparison services that do not require access to controlled and limited resources, strongly suggests that such access is an important factor underpinning our findings. When overall provincial cataract surgical rates were growing, new surgeons could access added volumes without necessitating a concomitant decrease in volumes among established ophthalmologists. However, providing opportunities for recent graduates has proven difficult following the levelling-off of total and per-surgeon case loads. The end of mandatory surgeon retirement may also have added to resource constraints faced by new surgeons. Hence, our results quantitatively support the view that resource allocation decisions effectively establish the demand for resource-intensive services.6 Consequently, human resource planning and policy must account not only for population health needs, but also for health system fiscal realities. Of note, Ontario’s Provincial Vision Strategy Task Force, a collaborative effort of clinical and government leaders that is charged with developing a framework for transformation of the eye care system, recently highlighted the need to ensure reasonable allocation of publicly funded operating room resources among surgeons at all career stages, while recognizing the natural arc of volumes expected over a career.32 Indeed, the problems identified do not stem from a glut of providers, as there remains unmet demand for ophthalmologic services, which is evidenced by access issues for many services, including eye exams for patients with diabetes.32 Hence, the task force recommendation aims both to improve surgical opportunities for recent graduates (to ensure ongoing, sustainable access to surgery) and to promote the provision of vital nonsurgical aspects of eye care where access has been inadequate. 33,34 The magnitude of the results we report suggests a pressing need to evaluate similar policies across many resource-intensive specialties in Canada. Our study was strengthened by its population-based approach, long study period and the natural experiment created by policy shifts. Furthermore, the inclusion of health care services from across the spectrum of resource intensity allowed us to evaluate the role of health system resource allocation and access in the developments that we observed. The study had weaknesses that warrant mention. We analyzed data at provincial and regional levels, and it is possible that smaller subregional and hospital-level variations exist. Although such variations would not affect our overall conclusions, it will be important for leaders to examine local data where human resources decisions are regulated at a subregional or hospital level. In addition, our results may not be generalizable to other provinces and specialties, and further studies are warranted. Nevertheless, survey data from the RCPSC and the National Physician Survey suggest that the issue is indeed widespread. Hence, our results and previous surveys provide complementary data that together provide a foundation for the next steps in research and policy development. We found that the practice of recent ophthalmology graduates has changed substantially, with a significant decrease in the provision of cataract surgery, a resource-intensive, volume-controlled surgical procedure. The lack of access to health system resources for graduates specializing in resource-intensive areas of medicine is likely to worsen, given the large expansion of medical school enrolment and residency positions in recent years.35,36 Given the threat to system sustainability, integrated initiatives involving multiple stakeholders, including provincial ministries of health, the CMA, the RCPSC, national specialty societies, residency programs and schools of medicine, will be required to address the issues facing recently graduated physicians in Canada. Contributors: Robert Campbell, Sudeep Gill, Marlo Whitehead, Robert Nesdole and Martin ten Hove were involved in the conception and design of the study and in the acquisition and analysis of the data. Robert Campbell, Sherif El-Defrawy, Chaim Bell, Sudeep Gill, Philip Hooper, Erica Campbell, Daniel Warder and Martin ten Hove were involved in interpretation of the data. Robert Campbell drafted the manuscript. All of the authors were involved in critically revising the manuscript, approved the final version to be published and agreed to act as guarantors of the work. Data sharing: In accordance with the Personal Health Information Protection Act of Ontario, the raw administrative data used for statistical analyses in this manuscript may be accessed only by agents of the Institute for Clinical Evaluative Sciences (ICES), a prescribed entity under Section 45 of the Act, for the purposes of conducting research that contributes to the effectiveness, quality, equity and efficiency of health care and health services. Robert Campbell is an agent of ICES and had full control over the data definitions and analyses used in this manuscript. Robert Campbell had full access to all the data in the study and takes responsibility for the integrity of the data and the accuracy of the data analysis. Funding: This study was supported in part by a grant from the Association of Canadian University Professors of Ophthalmology. Robert Campbell is supported by a Clinician Scientist Award from the Southeastern Ontario Academic Medical Organization. Sudeep Gill is supported by a Canadian Institutes of Health Research (CIHR) New Investigator Award from the Institute of Aging. Chaim Bell is supported by a CHIR and Canadian Patient Safety Institute chair in Patient Safety and Continuity of Care. Disclaimer: The sponsors of this study had no role in the design and conduct of the study; the collection, management, analysis or interpretation of the data; the preparation, review or approval of the manuscript; or the decision to submit for publication. This study was supported by the Institute for Clinical Evaluative Sciences (ICES), which is funded by an annual grant from the Ontario Ministry of Health and Long-Term Care (MOHLTC). The opinions, results and conclusions reported in this paper are those of the authors and are independent from the funding sources. No endorsement by ICES or the Ontario MOHLTC is intended or should be inferred.
. Specialty training out-of-sync with job market. CMAJ 2011;183:E1016.
. Death and seniors’ health dominate CMA annual meeting. CMAJ 2013;185:1126.
. Demand high but medical specialists not finding work in Canada. The National Post [Toronto]; 2011 Sept. 11. Available: http://news.national-post.com/2011/09/19/demand-high-but-medical-specialists-not-finding-work-in-canada/?__federated=1 (accessed 2016 Feb. 2).
. New neurosurgeons left jobless: Where’s the plan? CMAJ 2004; 170:1377–8.
. Bleak job outlook in some specialties sparking concern. CMAJ 2011; 183:1673.
. What’s really behind Canada’s unemployed specialists? Too many, too few doctors? Findings from the Royal College’s employment study. Ottawa: Royal College of Physicians and Surgeons of Canada; 2013. 59 p. Available: www.royalcollege.ca/portal/page/portal/rc/common/documents/policy/employment_report_2013_e.pdf (accessed 2015 Dec. 14).
. The Canadian Society of Cardiac Surgeons perspective on the cardiac surgery workforce in Canada. Can J Cardiol 2012;28:602–6.
. The cardiac surgery workforce: a survey of recent graduates of Canadian training programs. Ann Thorac Surg 2010;90:460–6.
. Unemployment in an underserviced specialty? The need for co-ordinated workforce planning in Canadian neurosurgery. 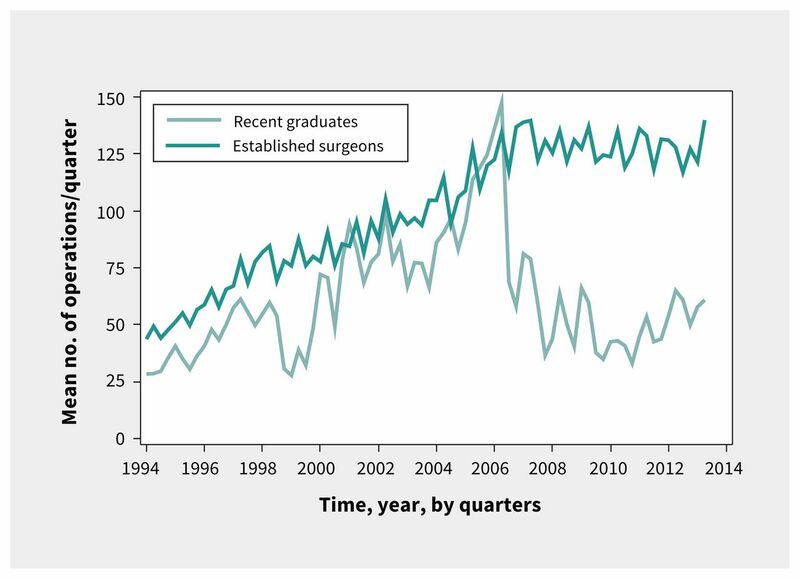 Can J Neurol Sci 2006; 33:170–4.
. Canadian surgeons face flat-lining job market. The Globe and Mail [Toronto]; 2011 Feb. 24. Available: www.theglobeandmail.com/life/health-and-fitness/canadian-surgeons-face-flat-lining-job-market/article568544/ (accessed 2016 Feb. 2).
. Spectre of unemployment dogging new orthopedic surgeons, COA says. Ottawa: Canadian Medical Association; 2013 Dec. 12. Available: https://www.cma.ca/En/Pages/Spectre-unemployment-dogging-new-orthopedic-surgeons.aspx (accessed 2016 Feb. 2).
. Canadian Collaborative Centre for Physician Resources bulletin: Through the lens of underemployed surgeons. Ottawa: Canadian Medical Association; 2013. Available: www.cma.ca/Assets/assets-library/document/en/advocacy/36-NPSSurgeonEmployment.pdf (accessed 2016 Jan. 27).
. Unemployed doctors: PAR-BC president speaks for medical residents on the shocking report [blog]. Vancouver Sun 2013 Oct. 25. Available: http://blogs.vancouversun.com/2013/10/25/unemployed-doctors-par-bc-president-speaks-for-medical-residents-on-the-shocking-report/ (accessed 2016 Jan. 27).
. More doctors without jobs as Canadians face long wait times. Canada.com [Postmedia Network] 2014 Feb. 17. Available: http://o.canada.com/news/national/more-doctors-without-jobs-as-canadians-face-long-wait-times (accessed 2016 Jan. 27). 2013 national results by province/territories. Mississauga (ON): National Physician Survey; 2013. Available: http://nationalphysiciansurvey.ca/result/2013-national-results-by-province/ (accessed 2016 Jan. 27).
. Building on values: the future of health care in Canada — final report. Saskatoon: Commission on the Future of Health Care in Canada; 2002. 392 p. Available: http://publications.gc.ca/collections/Collection/CP32-85-2002E.pdf (accessed 2015 Dec. 14). A physician human resource strategy for Canada: final report. Ottawa: Task Force Two; 2006. 47 p. Available: http://tools.hhr-rhs.ca/index.php?option=com_mtree&task=att_download&link_id=4673&cf_id=68&lang=en (accessed 2015 Dec. 14). National health expenditure trends, 1975 to 2015 — key findings. Ottawa: Canadian Institute for Health Information. Available: https://www.cihi.ca/sites/default/files/document/nhex_key_findings_2015_en.pdf (accessed 2016 Jan. 27).
. Projecting the growth of cataract surgery during the next 25 years. Arch Ophthalmol 2012;130:1479–81.
. Final report on work package II: comparing activities and performance of the hospital sector in Europe: How many surgical procedures performed as inpatient and day cases? Paris (France): Organisation for Economic Co-Operation and Development, Directorate for Employment, Labour and Social Affairs; 2012. Available: www.oecd.org/health/Comparing-activities-and-performance-of-the-hospital-sector-in-Europe_Inpatient-and-day-cases-surgical-procedures.pdf (accessed 2016 July 6).
. Ambulatory surgery in the United States, 2006. Natl Health Stat Rep 2009;(11):1–28. Available: https://www.cdc.gov/nchs/data/nhsr/nhsr011.pdf (accessed 2016 July 6). Cataract surgeries. In: Health at a glance 2013: OECD indicators. Paris (France): OECD Publishing; 2013. p. 100–1. Available: https://www.oecd.org/els/health-systems/Health-at-a-Glance-2013.pdf (accessed 2016 July 6).
. A summary of studies on the quality of health care administration databases in Canada. In: Goel V, Williams JI, Anderson GM, et al., editors. Patterns of health care in Ontario: the ICES practice atlas. 2nd ed. Ottawa: Canadian Medical Association; 1996:339–45.
. Subspecialization in glaucoma surgery. Ophthalmology 2012;119:2270–3.
. When laboratories report estimated glomerular filtration rates in addition to serum creatinines, nephrology consults increase. Kidney Int 2009;76:318–23.
. Population-based longitudinal study of follow-up care for breast cancer survivors. J Oncol Pract 2010;6:174–81.
. Interventions for angle-closure glaucoma: an evidence-based update. Ophthalmology 2003;110:1869–78.
. Physicians for Ontario: Too many? Too few? For 2000 and beyond: report of the fact finder on physician resources in Ontario. Toronto: Ontario Ministry of Health and Long-Term Care; 1999. 145 p. Available: www.health.gov.on.ca/en/common/ministry/publications/reports/mckendry/mckendry.aspx (accessed 2015 Dec. 14).
. Toward integrated medical resource policies for Canada: 1. Background, process and perceived problems. CMAJ 1992;146:347–51. Shaping Ontario’s physician workforce: building Ontario’s capacity to plan, educate, recruit and retain physicians to meet health needs: report of the Expert Panel on Health Professional Human Resources. Toronto: Ontario Ministry of Health and Long-Term Care; 2001. 114 p. Available: www.health.gov.on.ca/en/common/ministry/publications/reports/workforce/workforce.aspx (accessed 2016 Feb. 2). A vision for Ontario: strategic recommendations for ophthalmology in Ontario — the Provincial Vision Strategy Task Force. Toronto: Ontario Ministry of Health and Long Term Care; 2013. Available: www.health.gov.on.ca/en/common/ministry/publications/reports/ (accessed 2015 Dec. 10).
. Canadian health care: a question of access. Arch Ophthalmol 2009;127:1384–6.
. Diabetes and the eye. In: Hux JE, Booth GL, Slaughter PM, et al., editors. Diabetes in Ontario: an ICES practice atlas. Toronto: Institute for Clinical Evaluative Sciences; 2003:193–205. Available: www.ices.on.ca/Publications/Atlases-and-Reports/2003/Diabetes-in-Ontario (accessed 2016 Feb. 2). Increasing supply: partners in building Ontario’s physician supply. Toronto: Ontario Ministry of Health and Long-Term Care, Health Workforce Planning and Regulatory Affairs Division; 2013 Aug. 13. Available: www.health.gov.on.ca/en/pro/programs/hhrsd/physicians/increasing_supply.aspx (accessed 2016 Feb. 2). Canadian Post-M.D. Education Registry. 2013–2014 annual census of post-M.D. trainees. Ottawa: Association of Faculties of Medicine of Canada; 2014. 174 p. Available: www.caper.ca/~assets/documents/pdf_2013-14_CAPER_Census.pdf (accessed 2016 Feb. 2).